On autumn 2011 we had a nice hike to the Grande Jumelle, Via Novel (St Gingolph). 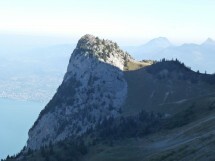 This Sunday, June 11, I’ll organize a hike to this summit and Lac de Taney, from Chalets de Bise (Vacheresse). From Chalets De Bise 1502 m, we go up to Col D’Ugeon and descend to the Montagne D’Au. From there we climb the Grande Jumelle 2215 m. Then get off to the Taney Lake. Take our picnic and bathe (if someone wishes) and go up to the Col D‘Ugeon and reach the car park. Elevation gain 1590 m. Distance about 18 km. The summit ridges (about 100 m in length) are slightly dizzy. Maximum 12 experienced and sporty hiker. Equipment: Good mountain shoes, hat, gloves, warm, cold and waterproof clothes, sticks, picnic, drink. etc… All participants must be well-prepared and have all equipment with themthem.